Explore the numerous day-trip ideas around Osaka: Nara (Tōdai-ji & Nara Park) and Koya-cho (Mount Koyasan & Okunoin). The adventure continues: find something for the whole family at Universal Studios Japan, examine the collection at Museum of Oriental Ceramics, enjoy breathtaking views from Kuchu Teien Observatory, and get a taste of the local shopping with Dotonbori. To find where to stay, traveler tips, maps, and other tourist information, read our Osaka itinerary maker. Singapore, Singapore to Osaka is an approximately 10.5-hour flight. You can also do a combination of car and ferry. Due to the time zone difference, you'll lose 1 hour traveling from Singapore to Osaka. Traveling from Singapore in November, things will get colder in Osaka: highs are around 20°C and lows about 13°C. Wrap up your sightseeing on the 15th (Wed) early enough to travel to Kyoto. Kyoto is known for historic sites, religious sites, sightseeing, parks, and shopping. Your plan includes some of its best attractions: steep yourself in history at Kiyomizu-dera, get advice or help at Fushimi Inari Taisha, don't miss a visit to Nishiki Market, and take in the spiritual surroundings of Ginkaku-ji Temple. To find more things to do, where to stay, reviews, and tourist information, you can read our Kyoto sightseeing planner. Kyoto is very close to Osaka. November in Kyoto sees daily highs of 20°C and lows of 11°C at night. Cap off your sightseeing on the 20th (Mon) early enough to travel to Nikko. 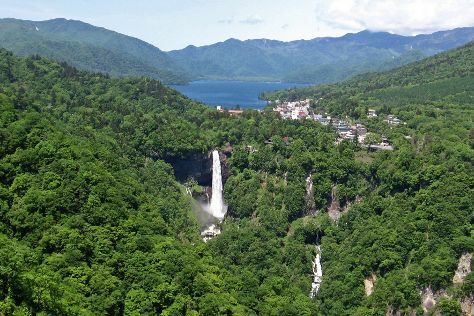 Nikko is known for nature, religious sites, historic sites, sightseeing, and theme parks. Your plan includes some of its best attractions: take in the spiritual surroundings of Nikkō Tōshō-gū, take in the dramatic scenery at Kegon Falls, get engrossed in the history at Kanaya Hotel History Museum, and snap pictures at Shinkyo. For photos, where to stay, ratings, and tourist information, refer to the Nikko trip itinerary maker. Getting from Kyoto to Nikko by train takes about 5.5 hours. Other options: drive; or fly. You'll have a few hours on the 23rd (Thu) to wrap things up before traveling home.